Back in China’s Spring and Autumn Period, between the eighth and the fifth centuries B.C., a musician named Boya was alone in a forest plucking on a guqin, a seven-stringed zither, when a passing woodcutter named Ziqi stopped to listen. As Boya strummed the sound of clouds, Ziqi saw them billowing; when Boya conjured a waterfall, Ziqi saw it cascading. 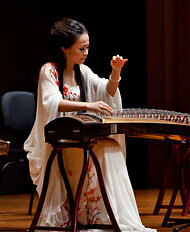 Yuan Sha, a renowned guzheng player, at the National Center for the Performing Arts in Beijing. A guqin from the Tang Dynasty. Such was the sympathy between musician and audience that Ziqi could imagine whatever thought was in Boya’s heart from the sound of his guqin. After many years, when the woodcutter finally died, Boya knew that never again would someone so intuitively comprehend his music. So he picked up his instrument and smashed it, never to play again. Although Boya is long gone, his musical successors have had ample occasion to share his angst. For much of the 20th century, the contemplative guqin ― the favored instrument of Confucius ― has lacked an understanding audience and been eclipsed by showier musical instruments, including Western imports like piano and violin. But, after decades in the shadows of China’s musical life, the guqin is making a comeback, riding a wave of renewed interest in the nation’s traditional culture and the government’s efforts to promote this. Indeed, the guqin was the quintessential musical instrument of traditional China’s educated elite. For millennia, any gentlemen worth his salt was expected to be proficient at it, along with chess, calligraphy and painting. The guqin was believed to be the instrument best able to link man and cosmos, to harmonize heaven and earth; some even claimed it could summon ghosts, cure disease, make birds dance and fish fly. The paulownia tree, from whose wood the instrument is crafted, was believed to be special, thriving in remote areas, standing still as a spirit, and absorbing the luminescence of sun and moon. Proper playing of the guqin is a metaphor for good governance ― “if the large strings are too tight, the small strings will break” ― and emperors were often portrayed holding a guqin. Perhaps unsurprisingly, guqin collecting has reached fever pitch in recent years. In 2010, a guqin owned by Emperor Huizong of the Song Dynasty sold for 137 million renminbi, about $22 million, by most accounts the highest price ever paid for a musical instrument. Gaining popularity even faster than the guqin is its more populist cousin, the 21-string ― the number of strings can range from 18 to 26 ― zither known as the guzheng. Guzheng are more affordable than guqin and easier to play, with a movable bridge under each of its strings. A guzheng performer wears picks on the right hand and presses or slides the fingers of the left hand to create vibrato or ornament the pitch. The guzheng is louder, better suited to public performance and ensemble playing, and unburdened by heavy philosophical baggage. Millions of children are learning it. Ms. Yuan, with her husband, Wang Guangming, manages an extensive network of 160 guzheng studios in 10 provinces. The guzheng studios overseen by Ms. Yuan and Mr. Wang are so successful that they are now offering instruction in erhu (two-stringed fiddle) and pipa (Chinese lute), and branching into other areas of traditional culture like Kunju opera and calligraphy. They also have plans to establish an executive training center in Beijing aimed at white-collar workers and government officials who want to study guqin or guzheng. While promoters of traditional culture are delighted with the renaissance in guqin and guzheng studies, they also acknowledge that there are problems. For the guqin, a shortage of instruments has led to waiting lists, and it takes at least two years to make one. Considerable debate exists concerning the technique used to play the guzheng and technical “improvements” that have been made to the instrument over the course of the 20th century. That kind of thinking is no longer dominant.